We produce a new list of workshops every few months and these are usually available as hard copies in the shop. We also email customers who have expressed an interest and provided their email details to let them know that a new list is available. Most classes get fully booked within a few days of the list being issued so book early to avoid disappointment. If you are interested in receiving details about our workshops, please let us know by completing the form on the contact us page. Our light and spacious teaching area is located at ground level at one end of the shop. Class numbers are determined by the activity and the degree of attention each student is likely to need from the tutor. For example, our beginners’ classes are usually restricted to 4 students. Most other classes have a maximum of 8 students. Each participant gets their own table. We try to offer a wide selection of project based workshops to cater for different skill levels. We also run regular 'block of the month' classes, which are very popular. 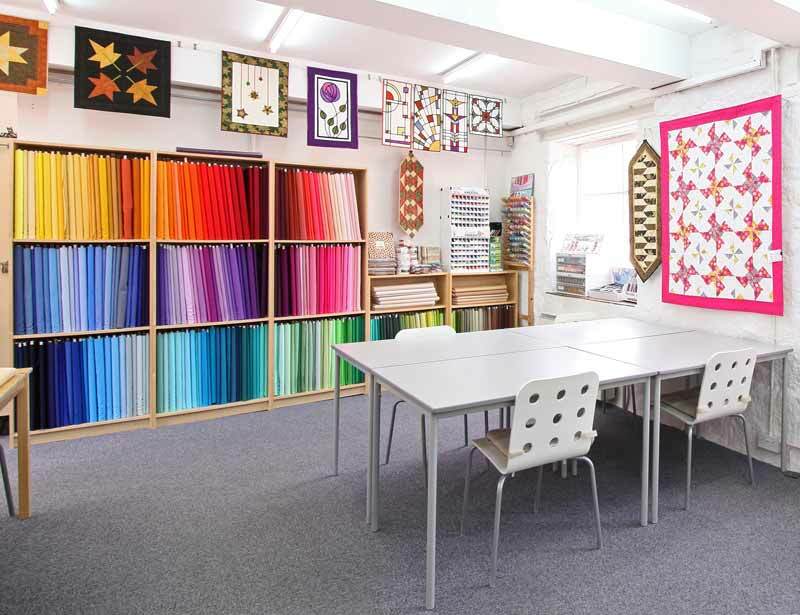 Many of our students enjoy the social aspect of getting together with other quilters for a few hours whilst learning a new technique or improving their existing skills. Ann teaches most classes using instructions prepared by Darren but we also employ excellent visiting tutors from time to time. Below is a photo of part of our workshop space. Below are attendees at our Hakkaku class displaying their day's hard work. Hakkaku, Japanese for octagon, is the name we gave to this pattern, which was the first one Darren designed for Quiltessential. It is ideal for showing off a large central panel and is available to buy, along with many more of Darren's designs on our quilt patterns page. Below are three pictures from different beginners' classes. Attendees proudly display the completed cushion covers they made in the one day class in which they learnt how to accurately rotary cut fabric and join pieces together with a quarter inch seam to make a cushion cover. They also got their first experience of choosing fabrics to use, hence the variety of fabrics in the finished cushion covers. They all seemed to enjoy the day and were amazed at what they had achieved in a few hours. We hope this will be the start of many happy years of quilting for these new stitchers. Well done to you all! 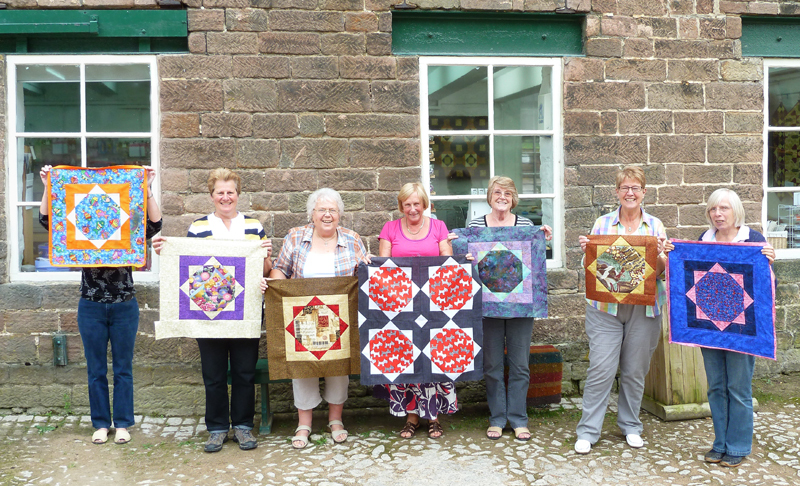 There are more pictures of workshop attendees with their quilts on our facebook page.